Have You Given Someone Access To Your Website Yet? There will be a time when you will need to give someone else access to your WordPress dashboard. The reasons for adding new WordPress users could include needing someone to; fix an error on your website, add new functionality with a plugin, add customization to your WordPress theme, manage content on your behalf, and many more. In my business, I have clients and customers that want me to assist them with website maintenance and content management on a regular or one-time basis. I essentially combine the role of WordPress webmaster and virtual assistant to provide a comprehensive and somewhat complete WordPress support service. To perform this service, I require administrator access to the WordPress admin area. When someone else needs access to your WordPress website, it's good for them to have their own login instead of using yours. There will probably come a time when that person will no longer need or have a reason to access your website. If they have their own login, you can easily change their access level or remove them completely. It's good to know how to give the appropriate WordPress dashboard access level to others that are contributing to your website. It's also good to understand the different roles available and which role should be given to minimize unnecessary access and security risks. It's very important to know that giving someone else Administrator access to your website is essentially making them a co-owner. They will have as much control over your website as you do. This means full access to do things like deleting pages, posts, plugins, themes, etc..
A role defines a set of tasks a user is allowed to perform. The main role types that you can assign to someone are Administrator, Editor, Author, and Contributor. An administrator has full and complete ownership of a website and can do absolutely everything. This person has complete power over everything. Nothing is off-limits, including deleting everything. An editor can view, edit, publish, and delete any posts/pages, moderate comments, manage categories, manage tags, manage links and upload files/images. An author can edit, publish and delete their posts, as well as upload files/images. A contributor can edit their posts but cannot publish them. When a contributor creates a post, it will need to be submitted to an administrator for review. A contributor does not have the ability to upload files/images. 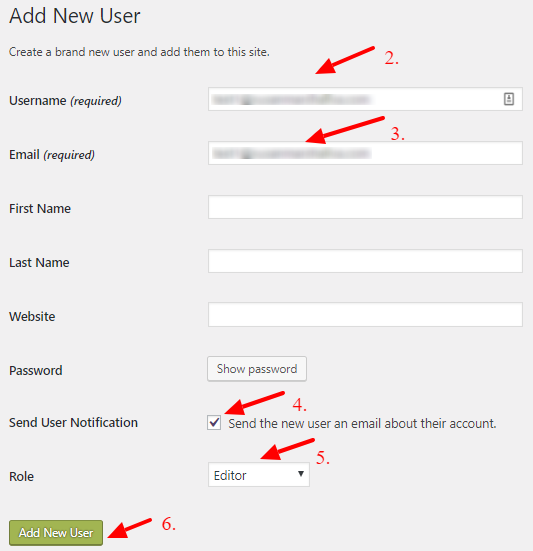 Once you determine what role the new user should have you can add the user to your website. The only information that you really need to give someone their own access to your WordPress site is an email address. 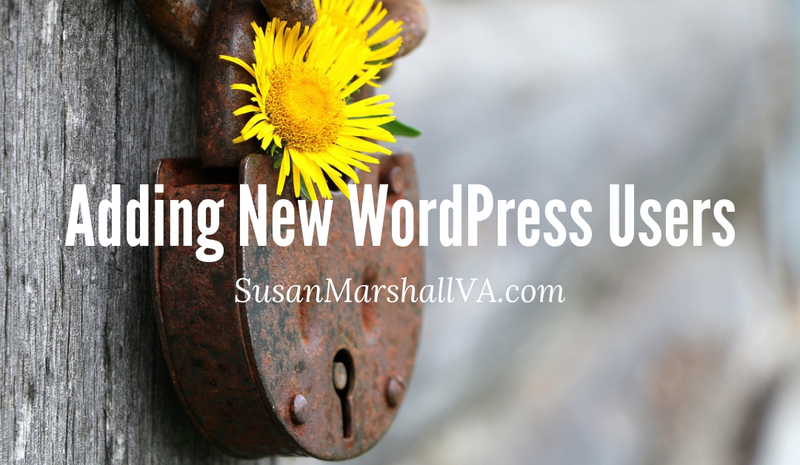 The new user should receive an email with a link to update their password and log in to your WordPress website. Optionally, there are plugins in the WordPress repository that you can use to add users. These can expire access for a user after an amount of time and/or deny users access to specific areas of the dashboard. Temporary Login Without Password – This plugin creates self-expiring, automatic login links. Give them to developers when they ask for admin access to your site. Or an editor for a quick review of work done. Login works just by opening the link, no password needed. You can also create a self-expiring account for someone and give them a special link with which they can log in to your WordPress without needing a username and password. You can choose when the login expires, as well as the role of the temporary account. This can be really useful when you need to give admin access to a developer for support or for performing routine tasks. Controlled Admin Access – This plugin creates a temporarily limited admin access good for themes designers, plugins developers, and support agents. You can choose which areas you don’t want the user to access and set it to expire at a later date. Capability Manager Enhanced – This plugin provides a simple way to manage WordPress role definitions (Subscriber, Editor, etc.). View or change the capabilities of any role, add new roles, copy existing roles into new ones, and add new capabilities to existing roles. If you have questions about your adding new WordPress users, please leave them in the comments below or send me a message. I invite you to find out more about my WordPress services and the WordPress maintenance plans I can offer you.